This is the first part of a multi party study of RTOS systems. We begin by studying behavior in non RTOS systems such as Linux and then contrast w/ a real RTOS system, tinyos. Finally, we will explore ways to improve the non-determinic limitations of Linux by tweaking the Scheduling system. Processes Modern, multi-process OSs CPU time is shared between processes. Under high load timers can be delayed showing non-deterministic behavior. This paper is a study in real-time operating systems by contrasting the limited deterministic guarantees of timers in multi-process (non RTOS) operating systems like Linux. 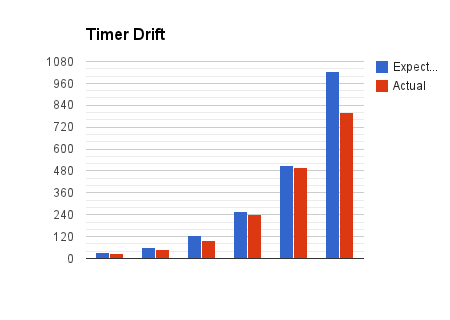 We explore the phenomenon of timer drift by developing a CPU bound-time heavy application that floods a network w/ UDP packets at a specified rate. At a high timer frequency, the effects of drift become apparent and an offset time becomes required to correct the drift. Also in order to send data at a rate greater than 200 Mbps multiple processes are required to maintain timing accuracy. Experimental results and analysis are included below. One way to achieve concurrency is through the use of child processes. In theory timers should allow our programs to achieve some measure of determinism, for example, do routine X every Y seconds. However as processes share processor time and are often swapped in and out timer precision cannot be guaranteed, especially as CPU usage increases. For this project we created a network traffic generator which makes heavy use of timers and processes. Theoretically, this should send exactly r megabits per second, however, in practice this is not the case. You will notice that the bandwidth is smaller than r. This is because our initial theory was based on the premise that all the routine calls in the loop (sendto, sleep) return instantly, however, this is not true, calls to routines have a return time overhead attached to them. This overhead is not constant either, it will drift based on the load of the CPU as a growing number of processes compete for CPU time. For this reason, we must plan for this drift and compensate for it. In order to have a perfect compensation one would have to implement an adaptive algorithm which can increment/decrement the drift offset as conditions change at runtime. In order compare the analytical hypothesis from the above section I ran a series of trials in which I recorded the maximum bandwidth achievable per process. 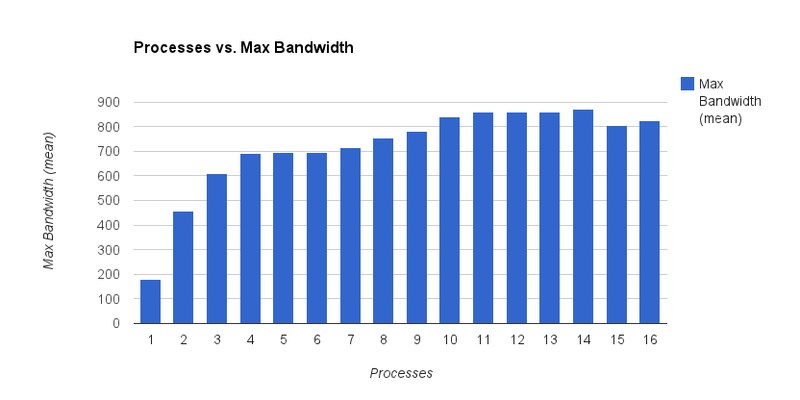 From my experimental results the max bandwidth achievable with 1 process was roughly 180 mbps. In reality, it could have gone higher, but I would lose too large a factor of determinism, as at any rate above 180 mpbs on 1 process, the timer frequency dips below 30 us which I have established as a minimum threshold for precision. In other words any timing frequency below 30 us is not deterministic and the bandwidth varies by second to a degree where it is not reliable. If the program bumps up to 2 processes the max bandwidth reached was around 458 mpbs – a more than double jump from 1 process. However, this growth rate isn’t sustained as a jump to 3 processes only nets 611 mbps and then reaches an asymptote of around 800 mbps as processes to infinity. At small bandwidths the difference between actual and expected is small, however, the lag grows as bandwidth increases and is exceptionally lagging at bandwidths above 512 mpbs. There are 2 possible explanations for this phenomenon. First, as the requested bandwidth increases so does the # of processes the app forks and thereby increases the load on the CPU and thereby each process is given a more strict scheduling allotment; and as we discussed in the introduction this will lead to increasingly more non-deterministic timers, which would explain the lag shown in Figure 2. Secondly, the constant drift may be the culprit. The app has a constant drift parameter which works fine for one process. However, as bandwidth goes up so do processes to handle the job, so thereby the load of each process decreases and with the constant drift in play across x processes the actual output will be delayed artificially. One solution to this would be an adaptive drift offset calculated at runtime as opposed to a constant. Figure 3: Variance (standard deviation) of bandwidth as a function of process number. Smaller bars are better – the more spread out the means high std. deviation which is not good. From my experimental results, it appears as though any timer frequency below 30 us is not sustainable and is non-deterministic. This is apparent from the high standard deviations in Figure 3, particularly for the 600 mpbs sample: at 3 processes, the 3 timers are maxed out at 30 us and therefore you see the high deviation and as processes goes up timer frequencies go down the the variance goes down also. This pattern is true for all bandwidth samples. Our initial hypothesis was correct in that timer drift and CPU scheduling has a large effect on the determinism of our program. However, its effect was underestimated in that a constant drift offset was not good enough to compensate for the time-variable conditions of a modern OS. For example on one instance with the same r and t inputs a drift offset of D may work fine, however, a few days later those same configurations will not produce accurate outputs and you will need to adjust D for the same r and t inputs because maybe your computer is experiences a higher load for some reason (background updates, etc). However, with the application of child processes the effects of drift can mostly be mitigated as the task it paralyzed the the timer frequencies can go down, in other words: timer frequency is indirectly proportional to process count. On my system the max bandwidth produced was in between 800 and 900 mbps.